Just as 1930s and 1940s Brooklyn Dodgers and New York Giants pitcher Van Lingle Mungo was surprised that Dave Frishberg wrote a song around his name back in 1969, so he might have been surprised to come across this book in the year 2014. 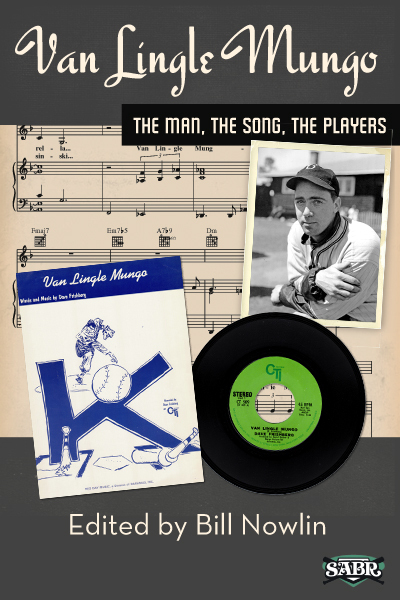 Frishberg's song "Van Lingle Mungo" listed 37 ballplayers in the lyrics. A different version contained three different names. That's a total of 40, and all 40 are represented with biographies in this book. Dave Frishberg himself has been a member of SABR since 1984. This book, largely comprised of biographies of all the players mentioned in the song, is the product of the hard work and dedication of 31 other SABR members. SABR is the Society for American Baseball Research, a group of over 6,000 enthusiasts about the game of baseball whose research interests range from the game's history to statistical analysis, records, cultural impact, and more. The BioProject is a SABR effort to research, write, and publish biographies of every player — and every person — ever connected with organized baseball. Anyone with a love of baseball can join SABR and become a part of these efforts. With contributions by Mark Armour, Lawrence Baldassaro, Ralph Berger, Alan Cohen, Warren Corbett, Rob Edelman, Dave Eskenazi, David Fleitz, James Forr, Jerry Grillo, Eric Hanauer, Mark Hodermarsky, Joanne Hulbert, Bill Johnson, James W. Johnson, Greg King, Norm King, Tara Krieger, Len Levin, Bill Nowlin, Armand Peterson, C. Paul Rogers III, Steve Rudman, Jim Sargent, Rick Swaine, Jim Sweetman, Stew Thornley, Joseph Wancho, Charlie Weatherby, and Gregory H. Wolf. E-book: Click here to download the e-book version of Van Lingle Mungo for FREE from the SABR Store. Available in PDF, Kindle/MOBI and EPUB formats. Paperback: Get a 50% discount on the Van Lingle Mungo paperback edition from the SABR Store ($15.99 includes shipping/tax). E-book: Click here to purchase the e-book version of Van Lingle Mungo for $6.99 from the SABR Store. Available in PDF, Kindle/MOBI and EPUB formats. Paperback: Get the paperback edition of Van Lingle Mungo from the SABR Store ($30.99 includes shipping/tax). For 40 years, SABR and its members have led the way in publishing the best baseball historical and statistical research. Our publications program is shifting to take advantage of new methods of publishing. Not only will we continue to publish new books like CAN HE PLAY? A Look At Baseball Scouts and Their Profession (released in December 2011); OPENING FENWAY PARK IN STYLE: The 1912 World Champion Red Sox (May 2012); Detroit Tigers 1984: What A Start! What A Finish! (December 2012); Sweet '60: The 1960 Pittsburgh Pirates (April 2013); Inventing Baseball: The 100 Greatest Games of the 19th Century (July 2013), and Thar's Joy in Braveland: The 1957 Milwaukee Braves (May 2014), which showcase the best efforts of SABR's members, chapters and committees, but new technology makes it possible for us to bring out-of-print titles like RUN, RABBIT, RUN: The Hilarious and Mostly True Tales of Rabbit Maranville (February 2012), GREAT HITTING PITCHERS (March 2012), NINETEENTH CENTURY STARS (August 2012); Batting (January 2013) and The Fenway Project (September 2013) back again. This page was last updated October 31, 2017 at 8:03 pm MST.